Literature is the art of written works and means "acquainted with letters". Literature has two major categories which are; poetry and prose. 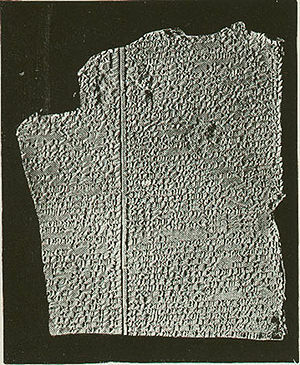 The Deluge Tablet from the Babylonian Epic of Gilgamesh. The Epic of Gilgamesh is a Babylonian story of the heroic character Gilgamesh and his friend Enkidu. It was most likely written during the Third Dynasty of Ur (2150-2000 BC). The text of The Epic of Gilgamesh is available online in its entirety. It is also one of the most earliest written works available for study today. A lot of ancient literature studied today has origin in the oral stories that developed within oral cultures in such places as ancient India and Palestine. Literary criticism is the study and evaluation of literature. It usually includes literary theory which is more the philosophy of literary criticism analyzing the methods of interpretation. Modern literary criticism begins with the communication theory of Roman Jakobson consisting of sender, message and receiver. For there to be successful communication between sender and receiver they must both be using the same code. This basic level understanding articulates the underlying principles that all communication theory is based on. In the greater context of history, within rhetoric during classical antiquity and especially ancient biography, literary criticism should be approached by a robust historical-critical literary criticism that includes rhetorical criticism as necessary for successful interpretation. Exegesis (from the Greek: ἐξηγεῖσθαι, exēgēisthai; "Name means::to lead out") is a critical exposition, commentary or interpretation of ancient literature especially religious books such as the Bible or Qur'an. The opposite of an exegetical reading of Scripture is eisegesis and instead of reading out what the text plainly presents it reads into the text what the reader is influenced by. The literary genre of any text is important because it not only tells the reader what kind of literature it is, but also informs the reader as to how to read it and what to expect. A genre is a category of the way a particular text is written. Literary genres are inherently flexible and often have subgroups or sub-genres as they are called. The literary genre is characterized by the writers tone, technique and the actual content the author wishes to convey. This page was last modified on 23 February 2014, at 16:48.